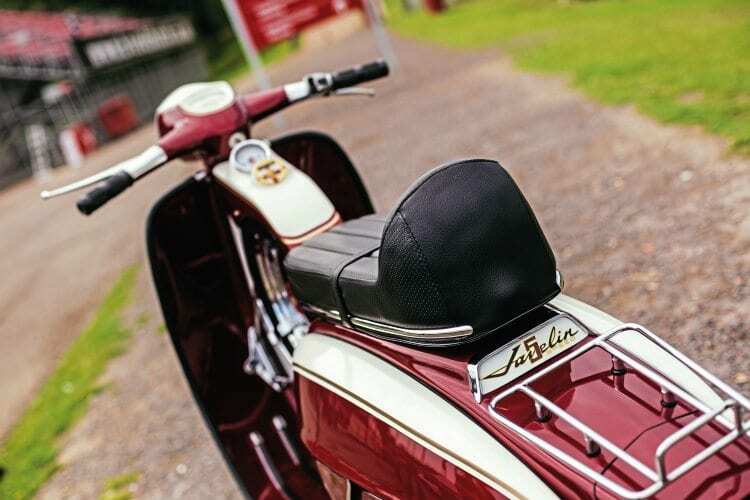 Meticulous attention to detail, staying one step ahead of the crowd and looking immaculately cool are all part of the ethos subscribed to by the original 60s Mods. 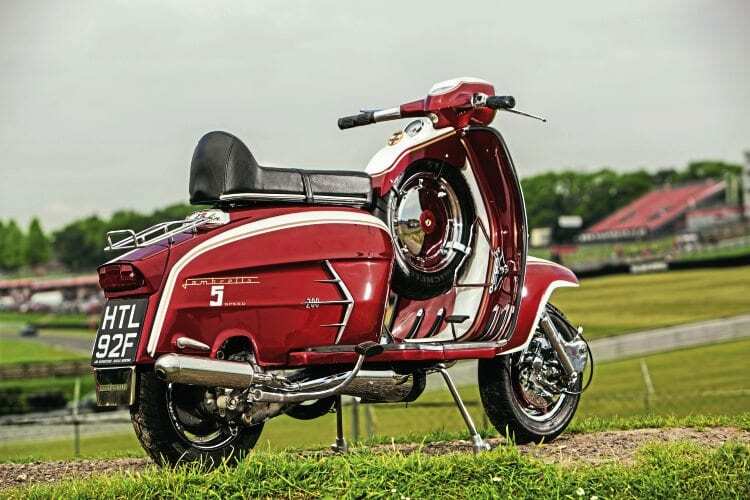 Frankie Clarkson has successfully applied all the above to his stunning SX Lambretta ‘The Shiny 5’. Since he first sourced the scooter back in 1999, for an eventual cost of just £20 (see Bargain Hunting in 1999 on p56), he’s treated the scooter to three major revamps. Twice it was out of choice, the third was forced on him, entirely due to near heart-breaking circumstances. 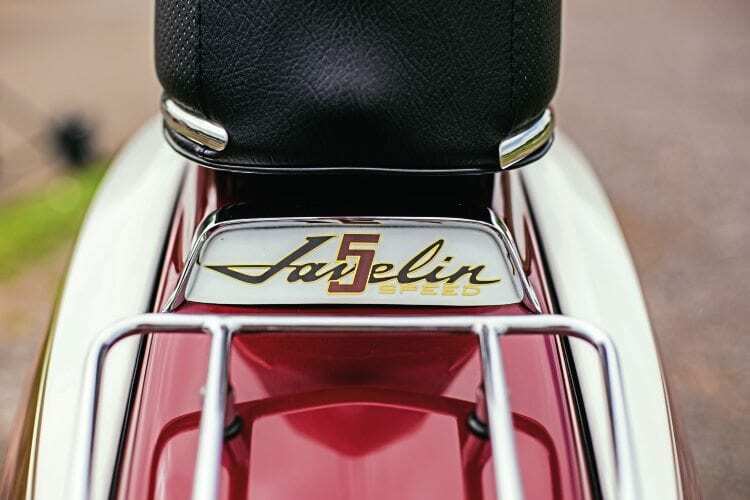 To trace the continual evolution of Frankie’s award-winning pride and joy it’s over to the man himself… “When I first got the SX, it had a sports front mudguard, no side panels or rear floorboards and had been painted matt black by hand. 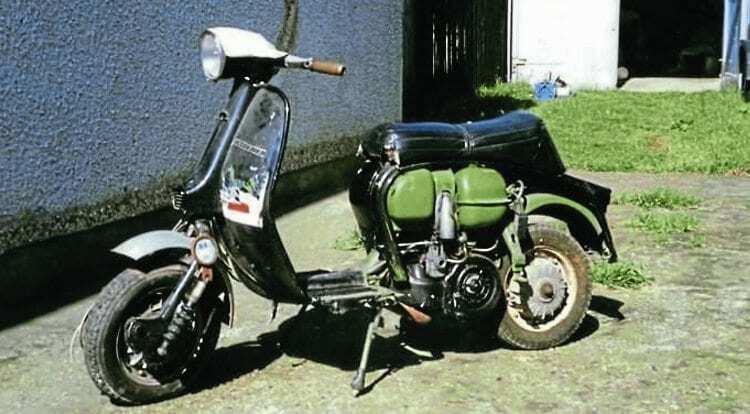 Toolbox, petrol tank and part of the frame were a dull, mid green. 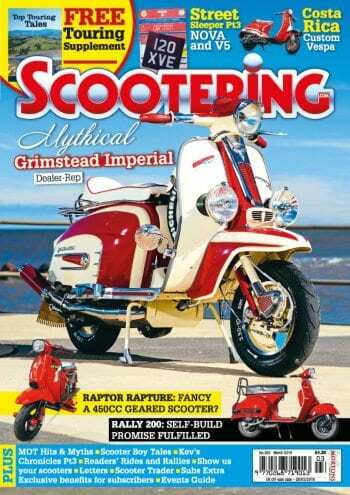 It was one of three Lambrettas I bought as a job lot. In 1999 I got back into the scooter scene after being out of it for a few years. 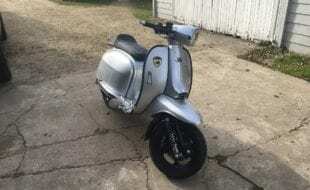 First scooter I got when I came back to the scene was a Vespa T5 which I picked up for £50. Once I got back onto the scene I was buying up scooters, doing them up and selling them on. 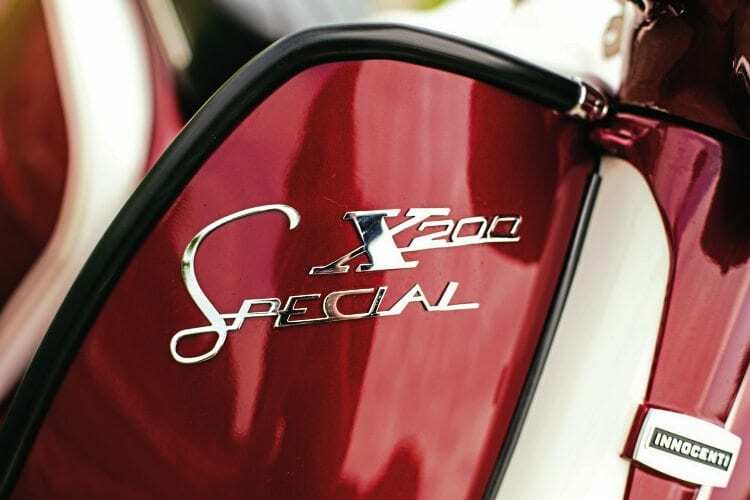 “In 2000 I restored the SX complete with mudguard panels and rear floor boards in white and red. On to 2003. 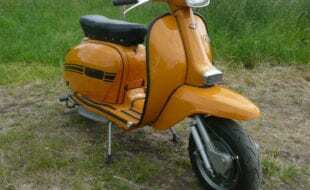 At the time I had the SX and a Series 2 Lammy. Both were parked up where I lived and I came home from work one day to discover the SX wasn’t there. It had been stolen. Gutted was an understatement to how I felt at the time. I reported it stolen, but didn’t hold much hope of ever seeing the SX again. Next day I heard some strange noises outside; I looked out the window to see three kids trying to nick my Series 2. “I shot outside to confront them and they ran off with me giving chase. I managed to catch the slowest of them. Not wanting to inadvertently leave myself open to any kind of counter claims, instead of holding the kid at my place and waiting for the police to turn up, I marched him to the police station which was a few miles away. Despite having done some of the police’s job for them by delivering one of the potential perpetrators who stole my SX right into their hands, nothing positive came from that. Nor did the police reunite me with my SX. Of course I’d put the word out to everyone I knew to keep an eye out for my scooter. 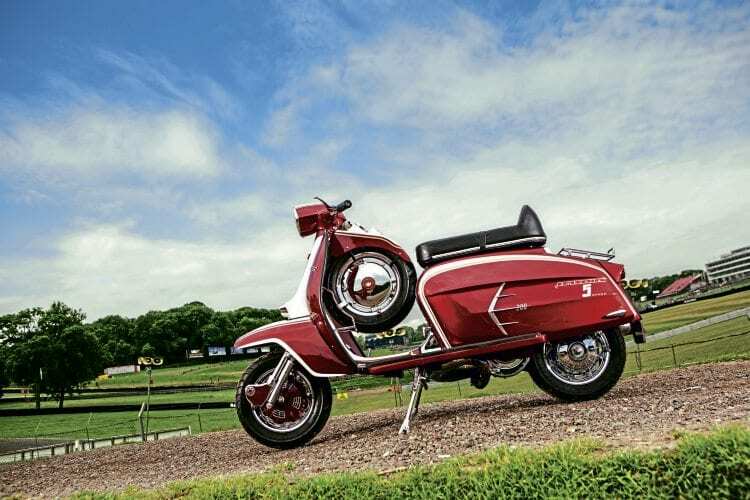 Since it was brought back to life, phoenix-like, Frankie has treated his SX to yet another complete and total makeover, which involved completely changing the specifications into more or less how it looks today. Reminiscent of a 60s street racer dealer special, it’s not a replica of anything, though it does mimic the appearance of an early Arthur Francis S-type. For its current incarnation Frankie, who has always done as much work as he can on all his scooters, handmade the spare wheel holder and console, which was the only part of the revamping that wasn’t as straightforward as he would have liked. 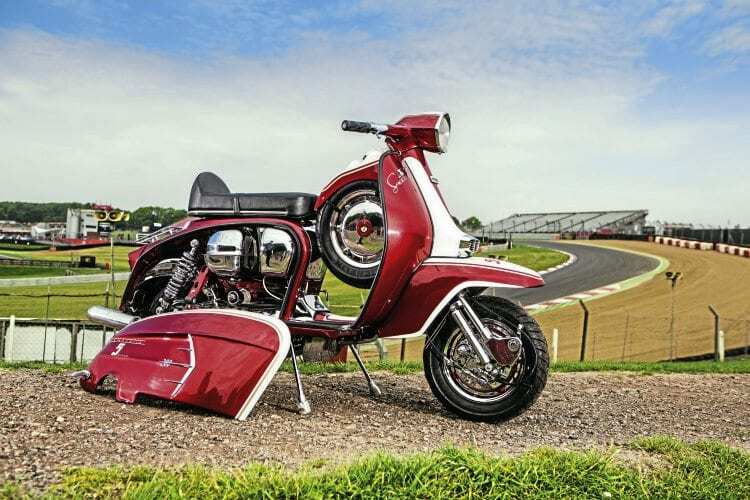 His painstaking efforts were worth the headaches as the end result looks absolutely right and wouldn’t have looked out of place 50 years ago, as an aftermarket extra for the then brand new SX200 Lambretta. The motor delivers a top speed return of 75mph — for a rundown of upgrades in that department, see Frankie’s spec sheet. 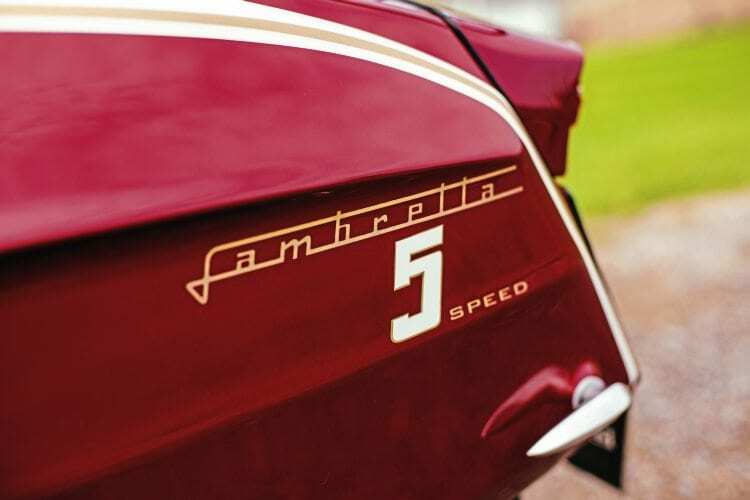 As for the name of the SX, Frankie actually hasn’t bestowed one, instead ‘The Shiny 5’ came from his mates, as it is so clean and shiny. 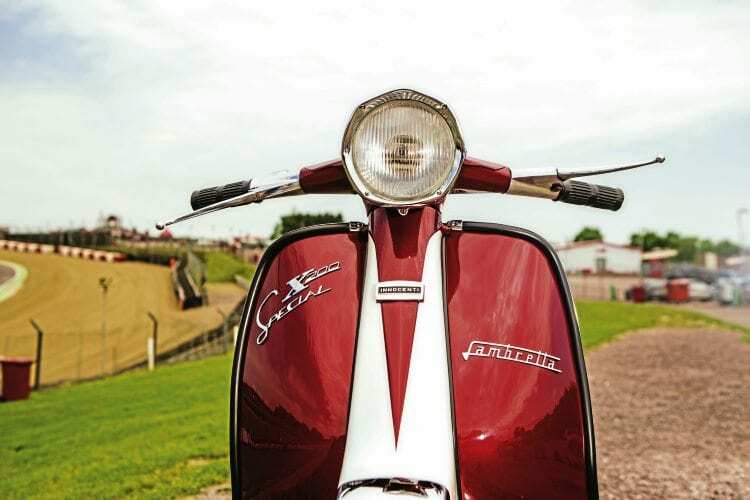 “My mates reckon I’m forever cleaning and polishing my SX, that’s where the (nick)name came from, and it’s kind of stuck. Truth of it is, I don’t clean and polish all the time, though I do have the chrome parts re-plated every year if required, and I have two sets of side panels for it as well.” Although Frankie currently owns a small fleet of scooters including four Vespas as well as a number of Series 1, 2 and 3 Lambrettas, his SX is used as his main ride. He rides it to and from work almost on a daily basis. Ridden not hidden being his mandate. A cabinet full of trophies, including winning ‘best of’ awards at the Isle of Wight rally for three consecutive years, plus recently winning best of show, beating the resurrected Dazzle at Gravesend Sentinels recently, one of a trio of trophies won there, are a testimony to Frankie’s approach. Proving the sentiments of those Mod ethics from the 60s are as applicable now as they were back then. 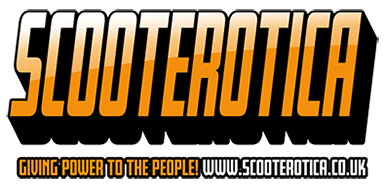 Scooter clubs: Ride with: Wasps, Odd Mods, Wimbledon Alliance and the Uppsetters. 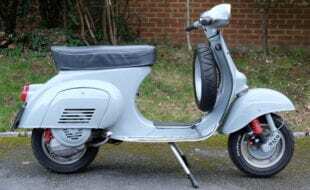 First interest in scooters: 1982 became a Mod and got a brand new Vespa 50cc from Wimbledon. 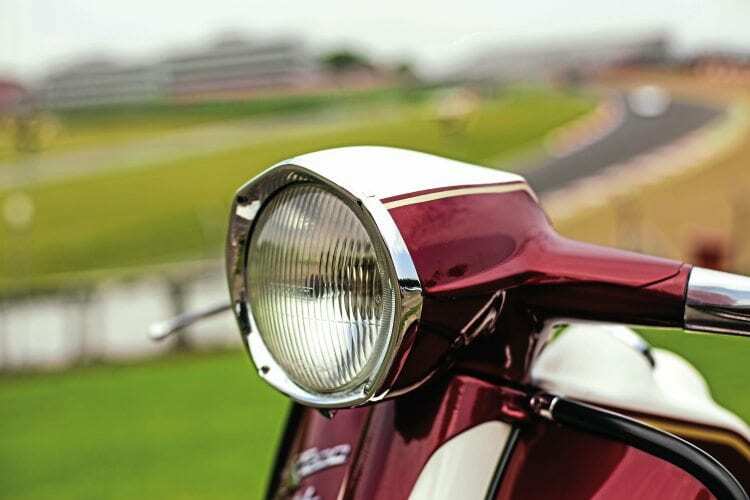 Favourite scooter model: SS90 Vespa SX200 Lambretta. Favourite style of custom scooter: Classic retro street racer. First rally or event: Margate 1982. How did you get there: Four hours on a Vespa 50 in the snow with no gloves. Any stories: Took 14 hours to get to Morecombe in 1984 as it rained all the way there. Blew a piston coming home in Birmingham. Favourite and worst rally/event: Best rally 1984 IOW, worst rally Clacton 1985. 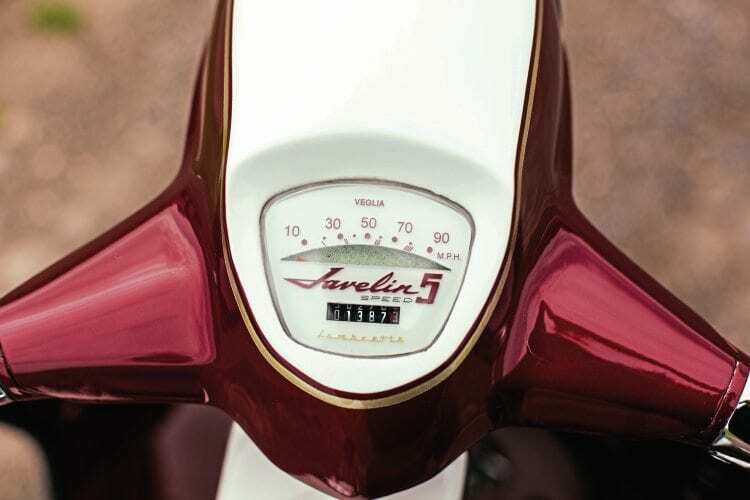 Favourite custom scooter of all time: Revenge. 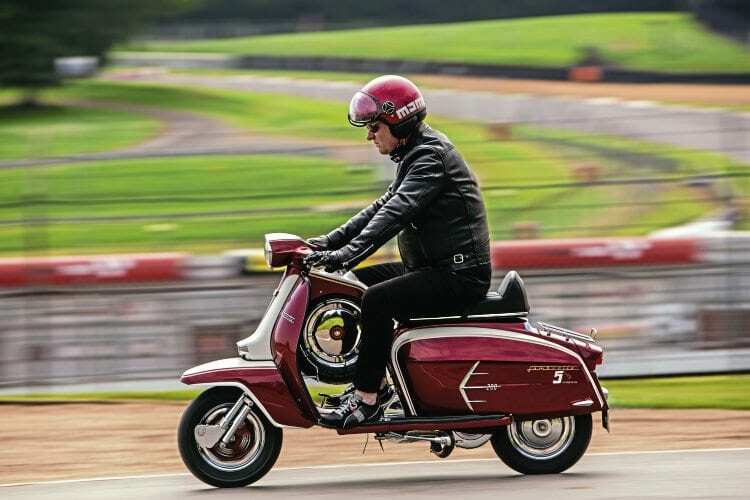 If you had to recommend one scooter part or item of riding kit what would it be: Protective jacket with armour. Date purchased/cost: £20 in 1999. Inspiration for project: It was stolen in 2003 and wrecked by kids so after it was found, 10 days later, we decided to do something different as opposed to just a classic look. Time to build and by whom: Took around 10 months to build first time round in 2003 and haven’t stopped since. I built it myself. Engine was done by JD Scooters (Mathew Sampson). Engine kit: Re-bored 1 oversize with ASSO piston. Other: Slightly ported with AF head. 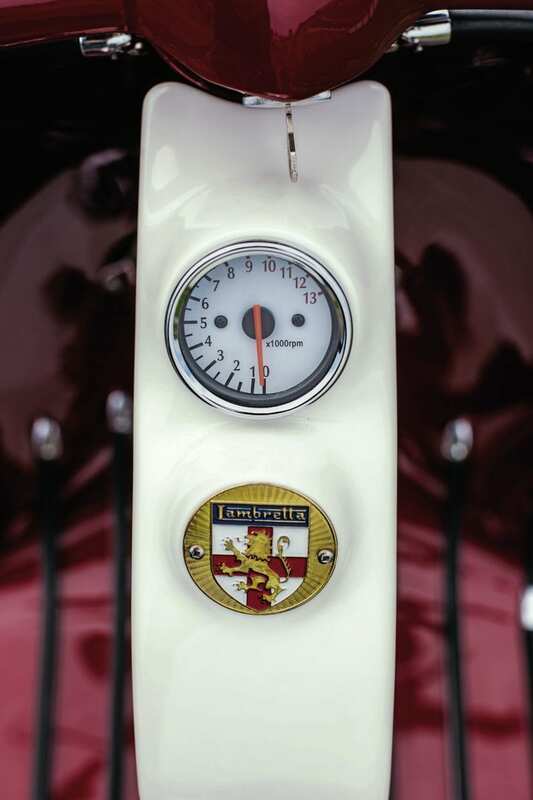 Are there any other unique details we have missed: Bespoke speedo and rear badge and a Taffspeed gas rear shock. 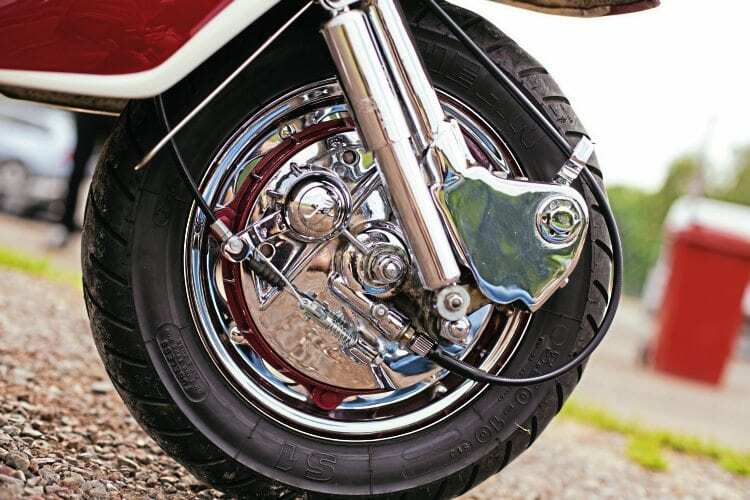 Vented front disc with reverse pull. Top and cruising speeds: 65mph cruise and top speed 75mph. Paintwork: Extreme Paint and Fabrications (Dale Challis). Engraving: Only on the end can by Kevin Adams. 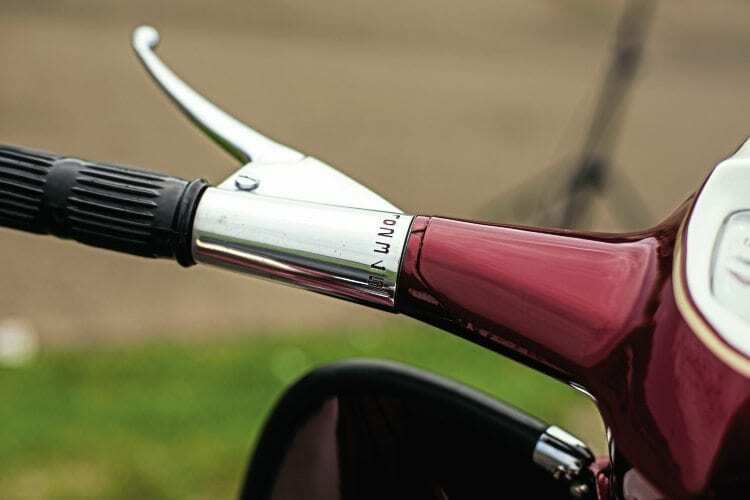 Chrome: All chrome by London Chroming, gets checked every year and re-chromed if need be. The hardest part of the project: To tell the truth it was missing around with the centre piece. Do you have any advice or tech tips for anyone starting a project: Dry build first is a must. 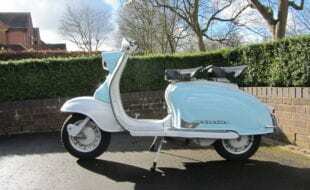 Is there anything still to add to the scoot: Nope finally after 15 years it’s finished! Mmmm we will see! In hindsight, is there anything you would have done differently: No, it’s worked out better than I thought. Favourite dealer: Allstyles Scooters, JD Scooters, JB Fabrications. Is there anyone you wish to thank: Dale Challis for the paintwork, Mathew Sampson for the engine. Jim Dennis for ideas on design. Dave Martin, Pinky Sparkle, thank you for your patience. 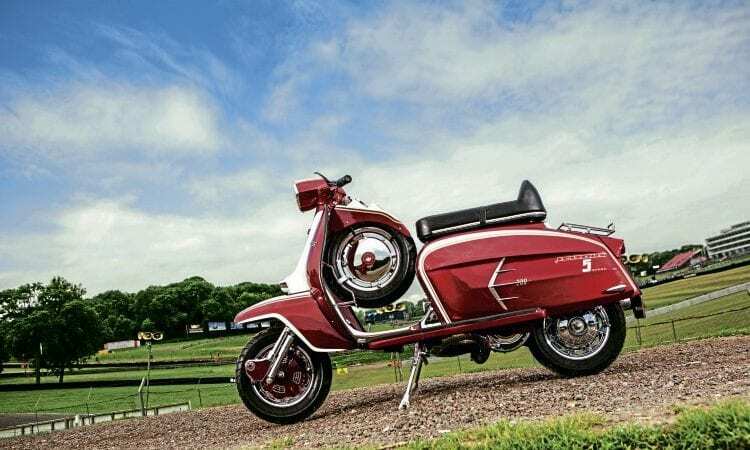 For some years after the ’79 Mod revival, despite a huge upsurge in demand for second hand scooters thanks to Quadrophenia, it was relatively easy to pick one up for £50 or even considerably less. Twenty years on prices had risen considerably. 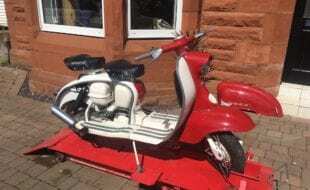 Finding genuine bargain priced old Lambrettas, Vespas and for that matter other makes of old scooters had become a rarity. Certainly that was the case in the UK. At the time, social media was a new entity and the Internet was just a shadow of what it has become today. Average prices for shed, garage and barn finds were beginning to rise and rise, although they were nowhere near the levels asked for what are basically basket cases today. Back then, for those with both time and the inclination to put in the necessary legwork, on occasion, determined efforts could be rewarded. Frankie invested quite a bit of his spare time back then searching for bargains. Probably his best haul, which included what is now The Shiny 5, for the (eventual) cost of £20 is a story worth sharing. “When I got back into the scene I was looking for scooters to buy up, do up and sell on. 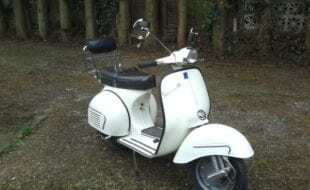 One of the first was a Vespa 50 special that I picked up for £50. Then one day I was in a pub in Croydon back in 1999 when I was introduced to one of my mate’s friends. We were all just talking when I asked the bloke the old question of what do you do for a living, and he replied that he worked for a scrapyard in Caterham. After a few more pints I asked him if he did garage and house clearances, and his reply was yes. I then asked him whether, it he found any scooters, he could give me a call. Frank’s SX200 cost £20 in 1999. “It was around three weeks later he called me one afternoon and said he had cleared a garage and found some scooters for me and could I go over there to have a look. So within five minutes I had left work and was driving like a lunatic to get there, wondering what I would find. On my arrival he took me into the yard and said ‘There you go,’ and pointed across the yard. I was trying to NOT look excited as when I looked I could see three Lambrettas. So I casually went to see what models they were (trying not to jump for joy)! 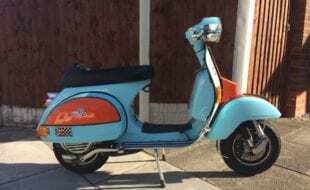 In 2016 tracking down old scooters, rare spares and original parts has become pretty much a worldwide business in its own right. Almost everything and anything is available… if you have an unlimited budget. Finding genuine bargains is a quest that’ only marginally less challenging than finding the Holy Grail. In the words of Mary Hopkin’s chart-topping single from the 60s: those were the days!